Phree Unscented Lady's Prebiotic Deodorant, 2.25 oz (Honestly PHresh) - Penn Herb Co. Ltd.
Our sticks are pH balanced. 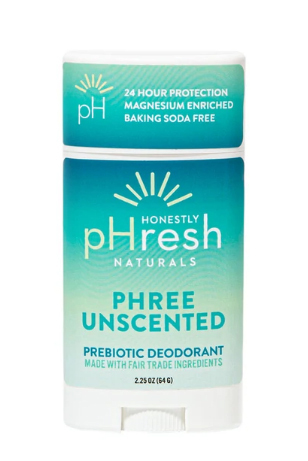 Most natural deodorant sticks are formulated with baking soda which strips the natural pH of your skin causing rash, redness and irritation in over half of the population- ouch! Our sticks are thoughtfully formulated with an innovation in natural technology using a balance of prebiotics, minerals and essential oils that work continuously in harmony to effectively keep you pHresh throughout the day without irritation. Our formula promotes the growth of healthy bacteria on your skin’s surface while attacking any gram negative or positive bacteria that causes body odor! All that without aluminum, parabens, phthalates, glycol, gluten, GMOs, or baking soda?! You better believe it! Fragrance: Unscented. Purely pHresh and impeccably clean.